The Jaguars (3-1) will play at Kansas City (3-0) next week — a game that features the league's top defense against one of the league's most potent offenses. Now it’s on to a tougher challenge, a more high-profile matchup. The Jaguars (3-1) will play at Kansas City (3-0) next week — a game that features the league’s top defense against one of the league’s most potent offenses. 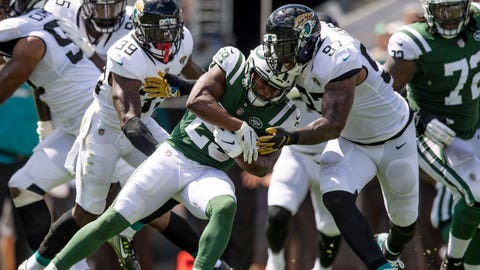 The Jaguars have put together four impressive defensive outings to start the season, allowing 324 yards against the New York Giants in the opener and then getting better every week since. New England (302 yards), Tennessee (233) and the New York Jets (178) scored a combined three touchdowns against Jacksonville’s vaunted defense. Two of those came off turnovers. New England’s first touchdown in Week 2 followed DJ Chark‘s fumble near midfield, and the Jets’ lone touchdown Sunday also was gifted. T.J. Yeldon fumbled at the Jacksonville 29-yard line. Trumaine Johnson scooped it up and returned it to the 5 . Sam Darnold connected with Jordan Leggett in the back of the end zone three plays later. The Jets managed little else. The Chiefs should be more difficult to cover, between speedster Tyreek Hill, fellow receiver Sammy Watkins, tight end Travis Kelce, running back Kareem Hunt and quarterback Patrick Mahomes. “The secondary welcomes these games,” Jaguars safety Barry Church said. “We know they’re going to throw the ball all over the place, so as a secondary we’ve got to go out there, prove that we’re one of top secondaries. Jacksonville had plenty of motivation the last four weeks: top executive Tom Coughlin’s first game against his former team (Giants), a rematch of the AFC title game (Patriots), a division game against the only team that swept the Jags in 2017 (Titans) and a third consecutive home game against the team that snubbed Doug Marrone for its head coaching job in 2015. Next up are the high-powered Chiefs. Jacksonville’s biggest concern is the health of running back Leonard Fournette, who re-injured his strained right hamstring after missing the last two games. Fournette ran 11 times for 30 yards before leaving for good. “Anytime you come back and you’re ready to go and then all of a sudden you get injured again, it’s not a good sign,” Marrone said. Marrone insisted he followed the chart, calling for a 2-point conversion after a fourth-down touchdown run in the final seconds of a lopsided game. Few believed him. Marrone was seemingly sending a message to the Jets , the team that passed on him three years ago and hired Todd Bowles. Marrone said he had no hidden agenda or extra motivation, which was hard to believe considering he took a subtle shot at Philadelphia Eagles coach Doug Pederson in late August. Jets rookie Sam Darnold was harassed early and often , getting sacked three times and nearly throwing three interceptions. Darnold completed 17 of 34 passes for 167 yards. He got little help since the 1-2 punch of Bilal Powell and Isaiah Crowell combined for 26 yards rushing.